Cloudy Bay was initially named l’baie Mauvaise by French explorer Bruni D'Entrecasteaux in 1792, after 1822 it was marked on the maps of the time as Bad Bay, and after 1859 became known as Bad or Cloudy bay. From the earliest days Cloudy Bay has drawn people to it, both for its wildlife and wildness, but before the advent of the roads as we now know them there were only tracks and later timber tramways. Whaling in the Bay was first recorded in the early 1830’s. Utilising the sea access and the safety of the recently erected lighthouse by 1837 Cloudy Bay had become the home of two whaling stations, one at Cloudy Corner and the other at Whale Bone Point. These however were gone by 1850. During the late 1800’s naturalists would visit to gather specimens, for the Royal Society of Tasmania, traipsing through the bush tracks from Lunawanna to the Lagoon, taking many hours for a return trip. Tasmanian photographers would carry their equipment long distances to record the beauty of the area for both the newly formed tourist association and to record events such as the mass whale stranding of 1917 for local newspapers. Holiday makers, bushwalking clubs and campers were joining those who were experiencing the joys of Cloudy. In fact for over a hundred years, articles have been appearing in both local and interstate publications. And of course an important consideration was that even though there was no hotel on the island; private accommodation could be arranged through the Tasmanian Government Tourist Bureau. 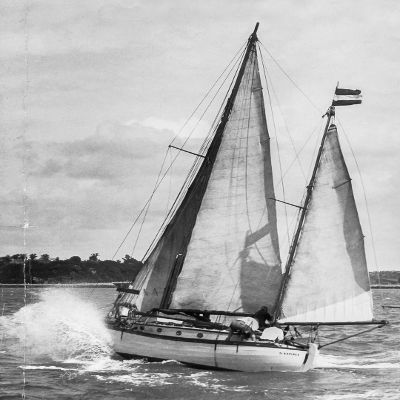 Excursions could be easily made to both The Bruny Island Lighthouse and to Cloudy Bay Lagoon, ‘where good sport was to be had’. Today access is easier, accommodation more comfortable and a regular ferry service available and even more importantly we still can hear Nature’s heart beating strongly in Cloudy Bay. 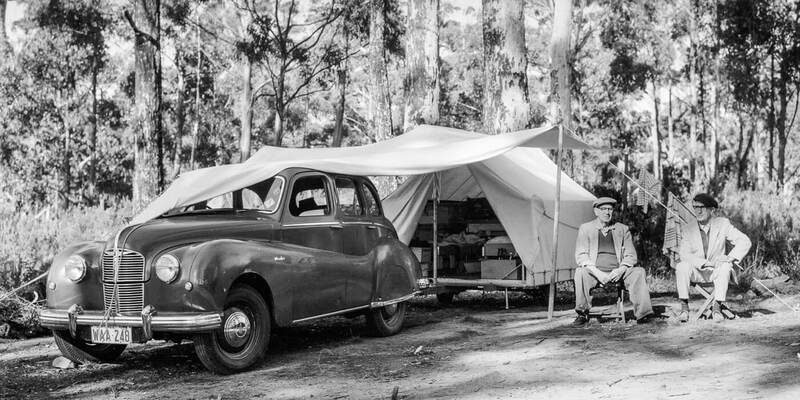 Photo Acknowledgements: "Alf Holding and Roy Taylor sitting beside Alf's caravan at Cloudy Bay entrance" - Tasmanian Archive and Heritage Office and the "Jack Thwaites Collection".